You may read the title of our blog and automatically think we're environmentalists out to save the planet. Well, that couldn't be further from our motives! 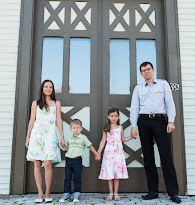 Our reason for making the choices we do is simple - we want our family to be healthy. We want our kids to be growing up with as little exposure to toxins as possible. That's why every day choices are important to us, from the food we eat to the paint on our walls and what we clean our house with. It's important to us simply for our own health, it just so happens that these choices are also 'good for the planet' and our ecosystem. Sometimes going green is really about keeping our wallet fuller, whether it is turning off the lights or water when we are not using it or filtering our tap water instead of buying expensive bottled water. As our kids grow they learn and understand why we make the choices we do and we tell them why others do things differently. They know that not everyone is aware of the chemicals in certain foods or skin care products. My four year old may tell you that some people simply do not know that "there are nasty chemicals in that!" There are so many ways you can make healthier choices for your family, here are some that work great for us. Some save us money and others end up being more expensive, but in the end all worthwhile. We are really thankful to have had the opportunity to try Washdrops this week, an amazing solution that enables you to wash your car with one bucket of water - no hoses or rinsing! We received a package of everything needed to wash the car, including sponges and microfiber towels. It was a chilly spring day but we made it a fun family affair with Baby T watching (strapped in the stroller so he doesn't run away) and Baby E helping out, I was the camera girl. We were kind of bummed our car wasn't very dirty, but we made it sparkle (only to have the landscapers spray it with wet mud the next day! Ha!). 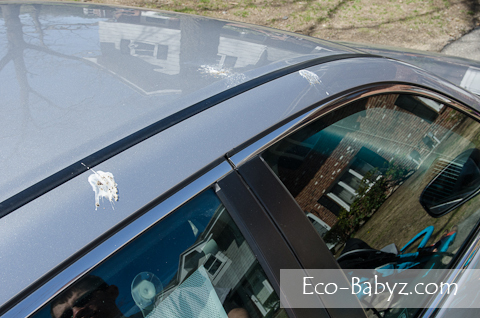 As you can see, the local birds use our car as a target, to my husband's delight. The Washdrops had no trouble removing that. The outdoor water faucet on our town home actually hasn't been working ever since we moved here, so attaching a hose is a painful, long process that involves screwing it to our kitchen faucet and dragging the hose through the house. Certainly not something you want to do just to wash the car. 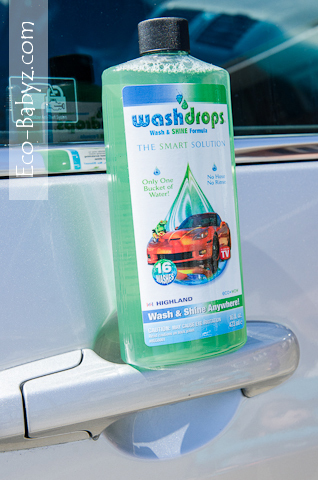 Washdrops makes it so easy and convenient to wash the car without a hose. I can totally see myself doing this with the kids in the summer for fun! It's great knowing there are no toxic chemicals and it's safe for my kids to help out. 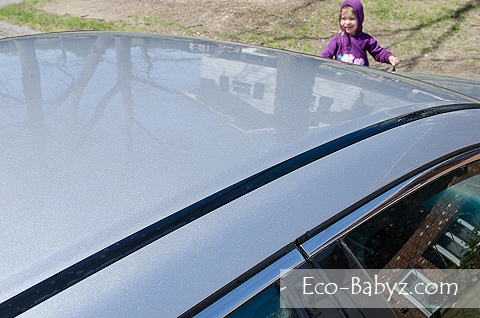 Baby E has super sensitive skin, which reacts to things like polyester and even kids bubbles. Lately she has even developed some eczema, which she has never had before. In general I just try to stay away from toxic chemical cleaners in the house and out. Washdrops fits the criteria of being non-toxic and safe for my kids. The Washdrops green car wash is completely biodegradable, solvent free, butyl free, phosphate free, and ammonia free. It's safe for washing anything you please - not just cars! It's like an all purpose cleaner that leaves things clean, shiny, and streak free. With just one ounce in a gallon of water you can wash an average size car without any need for rinsing! It seems counter intuitive at first since we are so used to hosing down a car or going through a car wash where literally dozens (if not hundreds) of gallons are used to wash off toxic soaps and residue. It really does work well, all you need is a bucket, a good soft sponge, a gallon of water, and an ounce of Washdrops. It's very reasonably priced at just $11.37 for 32 ounces, that's just $0.35 per car wash! It's available both on their website and on Amazon. If you're local, I'm sure you can spot our car pretty easily, can't miss that bumper sticker! Plus it will probably be the cleanest car for miles around, not only clean from dirt but also free from chemicals. While I admit we seldom wash the car and just let the rain do it most of the time, now we can stop spending those occasional $6+ on each car wash and only pay $0.35 each time. Even if you have a bigger SUV or mini van, you would still only pay about $0.40 to $0.80 for each time you wash the car. Since you only use a gallon or so of water, that expense is really negligible. We highly recommend Washdrops as a way to make healthier choices for your family, the planet, and your budget! Disclaimer: This is a sponsored post on behalf of Washdrops. I was provided a sample of the product for review purposes. All opinions are genuine and my own. Going green and saving the planet is important though, remember. Our children will inherit this planet! This is wonderful, I prefer to wash my car at home and besides I have three grandchildren aka little helpers! I agree that going green just for the sake of your children is worthwhile in and of itself, the fact that it benefits the planet as a whole is an awesome added bonus. Love that I do not have to worry about my kids washing the car!! im so excited to learn about this product! i love how safe it would be to use around my daughter and at just 35 cents a wash is great!! Sounds too good to be true. Convenience sells. My kids would love to wash our car that almost never get to be washed, living in the country with lots of dust, this would be nice. Not have to worry about chemicals, i would feel safer for my kids get their hands dirty. Thanks for the review! I think this is the coolest thing ever and I can't wait to try it. I hate fighting with the water hose when I wash my car. My husband used to use something similar when he did car washes with his special ed. students, but they either stopped making it, or he couldn't find it anymore. This sounds like it would be for them!! Since I don't own a hose... this would be ideal. This was a great product idea! no hose or rinsing!?! and eco friendly!?! im in! Perfect - because how hard I try I always get soaked when I was my car.